Hi, my name is Mack. I'm one of several kittens that just seemed to appear out of thin air here at M'Shoogy's. I don't know how I got here, but I'm glad that I am. Here I am safe, warm and I have plenty to eat. I don't have to worry about where my next meal is coming from. I have lots of feline buddies to play and nap with. 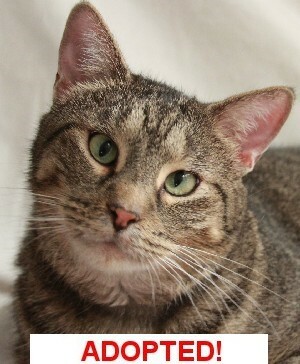 I am a handsome short haired brown tabby young guy that enjoys my quiet time napping either with a buddy or in a beam of sunshine. Playing, napping, eating it's all good. There are so many of us here that it's easy to get overlooked since I'm a little bit on the quiet side. Not shy, I just don't throw myself at visitors like some of these other shameless kids do. When you come to visit, look for the handsome quiet guy patiently waiting for your affection. It will be me.